When having problems with your internet connection, the first thing to try is, power cycling your equipment. 90% of the time, this resolves any issues you may have. Locate your Power Supply (POE), pictured to the left. This may be near your router or computer. Restart your outside equipment by unplugging this Power Supply from the power outlet. Wait 60 seconds then plug the Power Supply back into the power outlet. If you are using a router, unplug it from the power outlet and wait 60 seconds then plug it back in. After 5 minutes, check to see if your Internet Service has been restored. 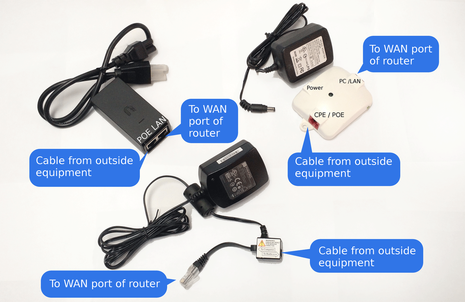 If none of these steps resolve your issue please try a Router Bypass or Contact Us. 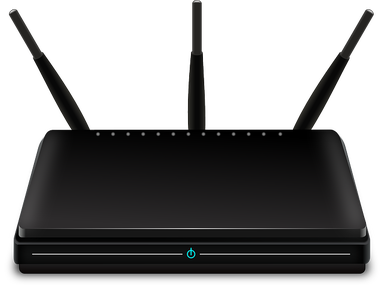 A Router Bypass can help determine if your router is causing any internet issues you maybe experiencing. Do NOTE this process will not work if a technician has giving you connection information (IP addresses) in the past to put into your router. Locate the LAN cable coming out of your St Joe Wireless power supply pictured above (Labeled as "To WAN port of router"). Unplug this cable from your router's WAN/Internet port. Plug this cable into a computer directly. Unplug the power to the router to keep your computer from trying to connect to it. Test to see if you can get online. If you are able to get online while directly connected to our service then you maybe having router issues. If you are NOT able to get online then please Contact Us. Any service visits not resulting in issues with our equipment will be subject to a Service Charge.